As President John F. Kennedy assumed office in January 1961, the space race with the Soviet Union would soon move beyond a competition to place satellites and animals in orbit—plans for human exploration were well underway. Again the Soviets led the way, exciting people around the world when a cosmonaut became the first human explorer in space. On April 12, 1961, cosmonaut Yuri Gagarin circled the Earth once in his Vostok spacecraft and returned safely. Gagarin's flight took place a month before American astronaut Alan Shepard's suborbital flight and 10 months before astronaut John Glenn became the first American to orbit the Earth. Gagarin's flight suggested, once more, that the U.S.S.R. was well ahead in the Space Race. 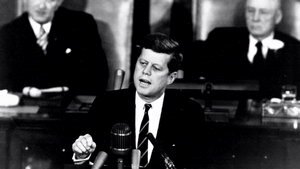 Immediately after Gagarin's flight, President Kennedy wanted to know what the United States could do in space to take the lead from the Soviets. Vice President Lyndon Johnson polled leaders in NASA, industry, and the military. He reported that "with a strong effort" the United States "could conceivably" beat the Soviets in sending a man around the Moon or landing a man on the Moon. As neither nation yet had a rocket powerful enough for such a mission, the race to the Moon was a contest that the United States would not be starting at with a disadvantage. The rationale for human exploration of the moon primarily came from a memorandum for Johnson prepared in early May 1961 by NASA Administrator James E. Webb and Secretary of Defense Robert F. McNamara. 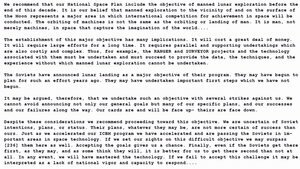 Excerpt of the memo “Recommendations for our National Space Program: Changes, Policies, Goals” from James E. Webb and Robert McNamara to Vice President Lyndon B. Johnson, May 8, 1961. President Kennedy spent several weeks assessing America's options for competing with the Soviets in space. On May 25, 1961, he announced the goal of landing a man on the Moon before a joint session of Congress. At that point, the total time spent in space by an American was barely 15 minutes. President John F. Kennedy on May 25, 1961, declaring to Congress the goal of landing a man on the Moon by the end of the decade. After President Kennedy's call for human exploration of the Moon, nearly all of NASA's efforts in space turned toward the goal of a lunar landing. Science missions were mounted to study the Moon with probes before advancing with human exploration. In the 1960s, Ranger, Surveyor and Lunar Orbiter spacecraft gathered data on the Moon by crashing into, landing on, and orbiting our nearest celestial neighbor. During these programs, thirteen robotic spacecraft transmitted detailed images of the Moon, probed the strength and composition of the lunar surface, and searched for landing sites for human explorers. Concurrent with the scientific study of the Moon, human exploration of space began. Project Mercury, jumpstarted by astronaut Alan Shephard's suborbital flight in May 1961, and the Gemini Program served as learning experiences in preparation for trips to the Moon. All of this effort fed into the Apollo Program, redefined and accelerated soon after President Kennedy's 1961 speech. Under Apollo, NASA took the final steps toward fulfilling Kennedy's bold commitment. 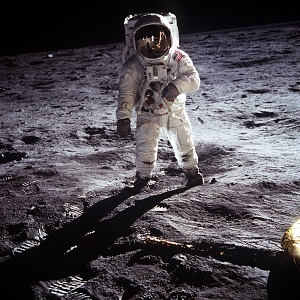 On July 20, 1969, Apollo 11 astronaut Edwin E. "Buzz" Aldrin walked on the Moon, reaching Kennedy's goal of putting a man on the Moon by the end of the decade.